Designed for the school auditorium and multipurpose municipal audience seating, these ergonomic, versatile and handsome seats offer a wide range of options, features and finishes—and value. All the modern advances in ergonomic comfort and the versatility of a modern seat with the traditional look and feel that you've been searching for. 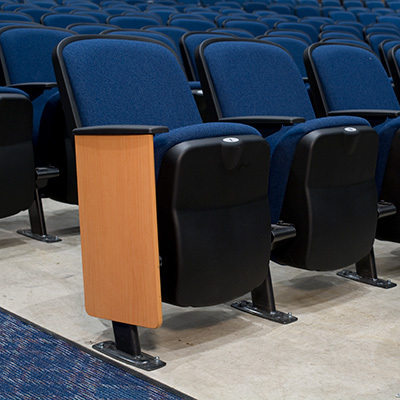 The Quattro Traditional seat uses traditional steel stanchions and a stylish end panel to complete the look of any auditorium, lecture hall, convention center, or worship space.